I am squeezed around a picnic table with strangers — a woman from Sweden, another from Australia, and a pair from Italy. Communication should have been a challenge, except we shared varying degrees of English and the lingua franca of plants and gardens. We are fellow pilgrims who have at last reached our goal, attending the amazing Chelsea Flower and Garden Show in London, England. We’re sharing a moment to grab a bite and summon the energy to plunge back into the surrounding crowd of beaming faces. This was in 2013 and my seventh visit to the show. You would think I’d seen enough, but each visit manages to eclipse the previous one, such is the magic of Chelsea. It’s been said that gardening is to Britain as cooking is to France, although there are rumours that Britain now rivals France in the culinary stakes. The Chelsea Flower show, however, is incomparable. 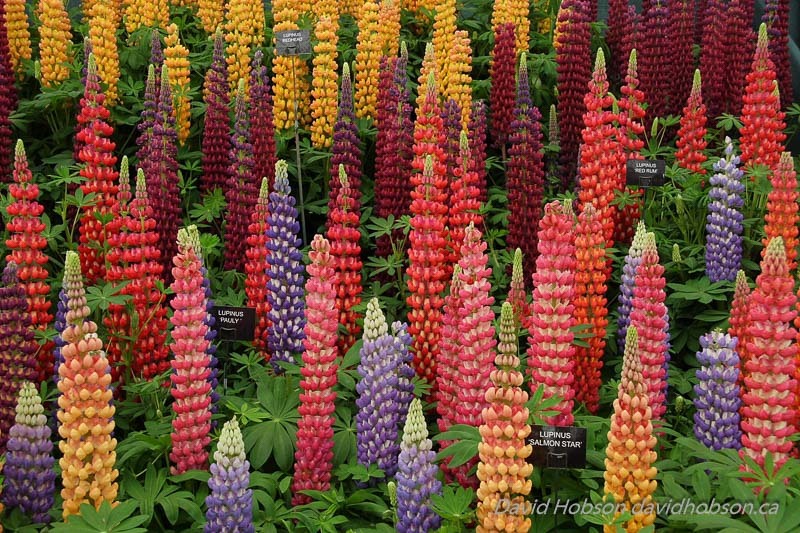 It takes place each year in late May, has been running for over a hundred years, and exemplifies Britain’s passion for plants. Presented by the Royal Horticultural Society, this international horticultural exhibition is the Olympics of gardening where leading designers and plant producers compete for gold medals. Winning gold can result in an exceptionally successful garden career and likely retirement to a villa in Tuscany. It’s also the first event each year of the London social calendar, attended on the first day — media day — by The Queen, who is Patron of the Society. On that day, other members of the Royal family frequently appear along with every celebrity with an interest in gardening — or an interest in being seen at this prestigious event. Actresses Helen Mirren and Maggie Smith are regulars, as is former Beatle, Ringo Starr. The show is then open to the public for the following five days. It takes place on four and a half hectares in the grounds of the Royal Chelsea Hospital, a retirement home for former soldiers. Chelsea Pensioners, as they are called, are revered by the British public and seen around the show, resplendent in their distinctive scarlet uniforms. Total attendance is capped for the duration at 157,000 otherwise it would be mayhem. 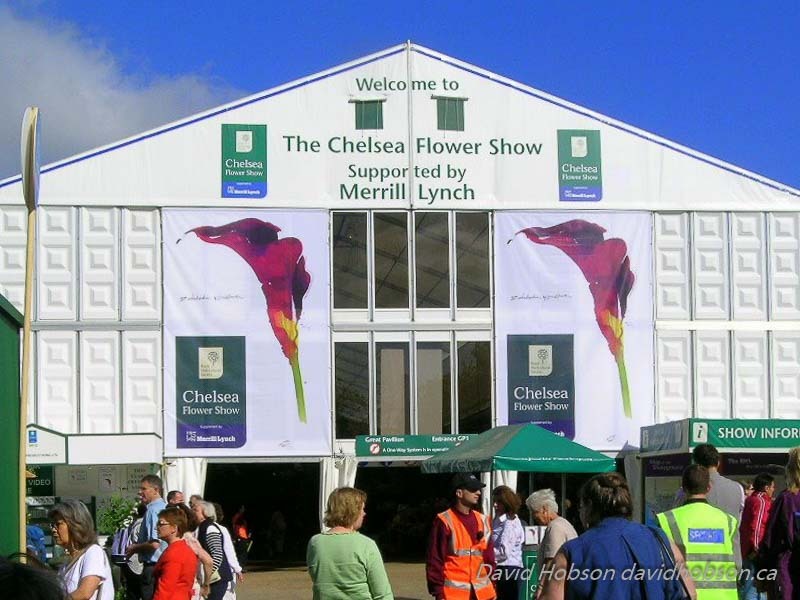 Unlike many garden shows, visitors at Chelsea are not allowed to stroll at will through the gardens. Rather, the large show gardens are designed to be viewed from up to three sides, making it a better experience — no people-cluttered images for the photographer. This means, however, that everyone follows the typically British queuing protocol as they politely jostle their way to the front. sked with creating a garden that would capture a soldier’s nostalgic vision of home at the close of the Second World War. 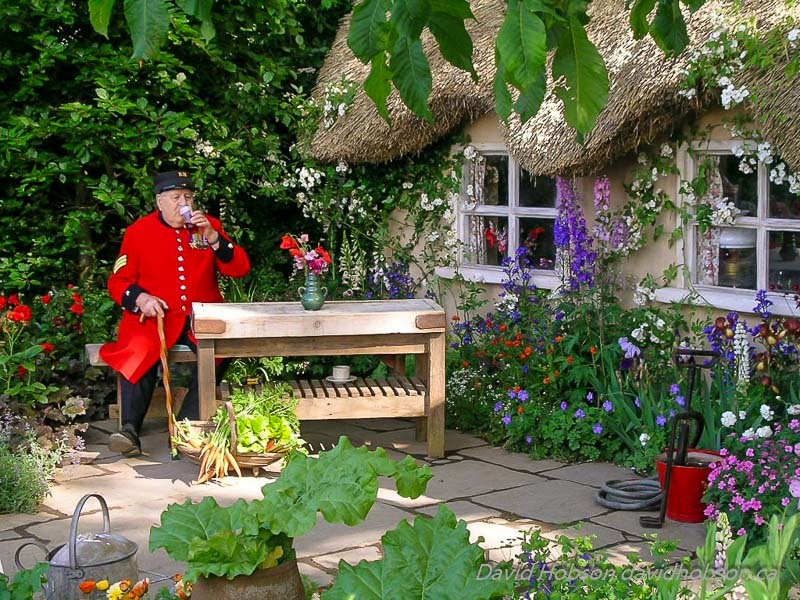 After chatting over a pint with a group of Chelsea Pensioners, the result was A Soldier's Dream of Blighty, an authentic thatched country pub with rhubarb and roses in the front yard and red poppies lining the pathway. The Chelsea pensioner sitting on the garden bench quaffing a pint of beer perfected the emotive setting, bringing tears to the eyes of admiring well-wishers. This is an example of how a talented designer can create a space that extends beyond plants and flowers to make a deeply emotional connection. Perfection is the rule at Chelsea, both in the garden designs and the plants. Take those poppies, which volunteers had spent the night warming with heat lamps to ensure they would be open in time. Each year, fifteen to twenty of these large show gardens are meticulously assembled over three weeks of intense activity as crews toil to create flawlessness, yet temporary gardens that appear to have been in place for ever. Each one is easily the size of our typical suburban backyard and all are sponsored as they require wheelbarrows of cash, averaging over half a million dollars or more. For this the finest of garden designers are summoned, someone like Cleve West, winner of numerous medals. In 2011 I was in awe of his sunken garden, inspired by a visit he made to Roman ruins in Libya. From a cream-coloured wall, water flowed from multiple pipes, the sound perfected by days of testing to ensure the exact rate of flow would produce the precise sound he wanted as it flowed into the pool below. Sculpted columns, one toppled and artfully overgrown by sprawling flowers, captured the sense of antiquity. Plants are provided by specialist nurseries around the country while many rare trees and shrubs are imported from warmer climes. All are held in precisely controlled conditions to ensure they are immaculate at show time. This was never more evident than in a garden designed in 2008 by Tom Stuart-Smith which, besides winning a gold medal, won the prestigious Best in Show, a coveted award bestowed based on votes from show visitors and TV viewers. The show receives wide coverage on TV and is reviewed each evening by Britain’s gardening luminaries, almost in the manner of Coach’s Corner with Don Cherry and Ron McLean. I found viewing Stuart-Smith’s masterpiece a peaceful, sublime experience. No massed plantings of colourful flowers, but simply shades of green with a few clusters of white peonies and Astrantia. 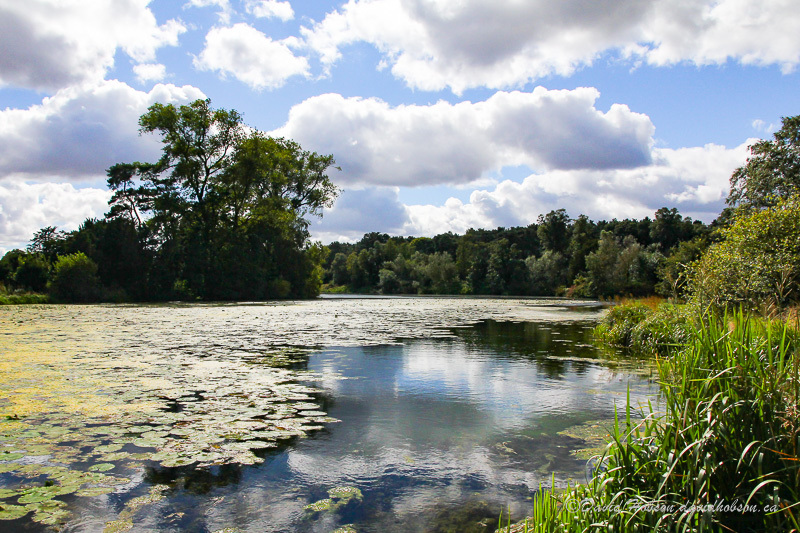 Among the layers of foliage plants, perfectly positioned zinc tanks of still water reflected clouds formed above by the careful pruning of Hornbeam trees, six metres high. It was like discovering a dreamy secret within a forest. 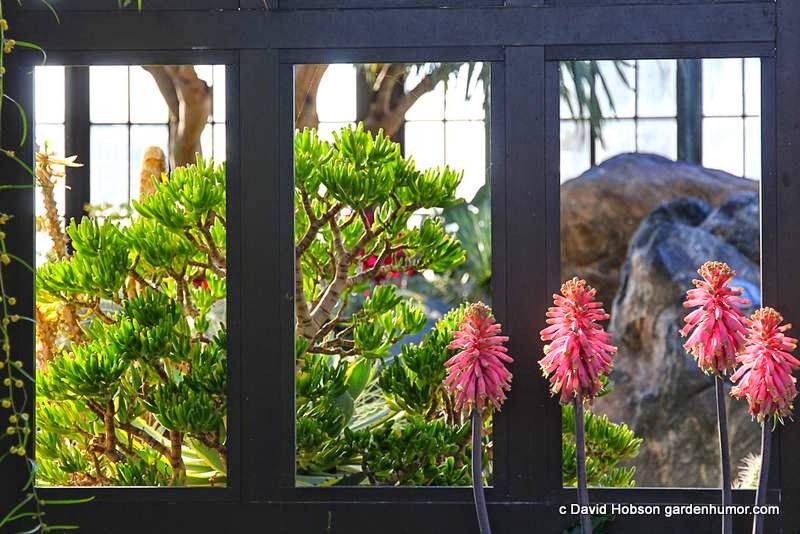 For a startling jolt of colour, a lively crew from Australia frequently wins gold medals with their designs featuring antipodean plants with hardscaping in bright reds reminiscent of an outback landscape. No kangaroos, but their 2011 garden did manage a water feature in the form of a boomerang. These large gardens range in concept from traditional through contemporary, avant-garde, even radical. Diarmuid Gavin of Ireland, a regular at the show, likes to shock and surprise. Hugely popular in 2011, his Avatar-inspired sky garden floated above the show suspended by a crane. I would have loved a ride, but only lucky VIPs were allowed aboard. 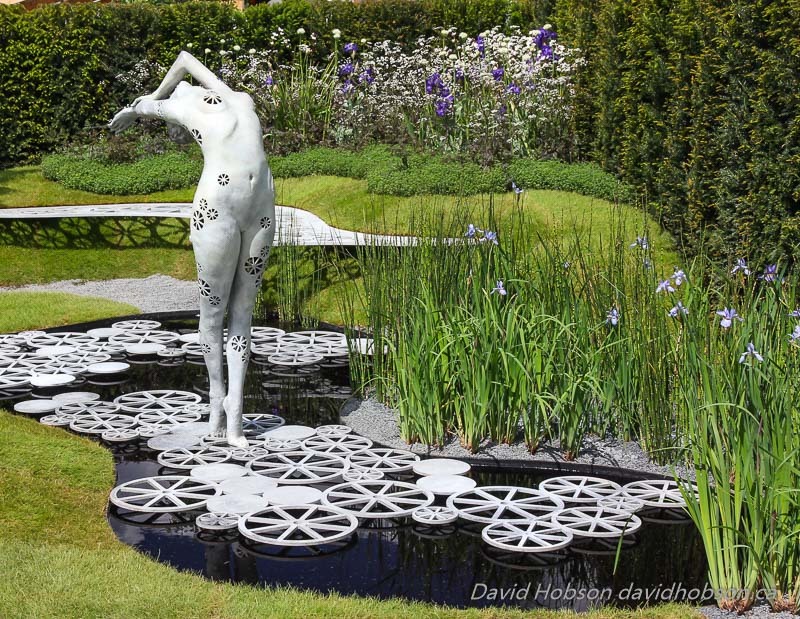 Gavin’s unusual concept for a garden attracted plenty of criticism, but still managed to win gold. Just don’t remind the principal sponsor, Cork city council in Ireland and its taxpayers. The final bill was said to be around $3,000,000. That would purchase quite a chunk of ION track. Regardless, Gavin’s wildly unique concept gardens are one of the show’s delights. Among my especially memorable large show gardens is another from 2008 that told the story of former Beatle George Harrison. His life was commemorated at Chelsea in a garden designed by his widow Olivia Harrison and landscape designer Yvonne Innes. Along a meandering pathway, George’s life unfolded, beginning in his father’s garden plot in Arnold Grove, Liverpool. The path continued, becoming a mosaic of the explosively psychedelic colours of ‘60s culture, past a glass wall bearing an image of a contemplative George in his garden inscribed with his song lyrics, “Floating down the stream of time, from life to life with me.” The journey ended at a white gazebo in a peaceful garden of white flowers representing his spiritual arrival in Nirvana. With one of his songs running through my head, this evocative illustration of his life captivated me. Perhaps less emotive are the artisan and urban gardens. Around 30 of these small gardens, only five or six metres square, are grouped side by side along a wooded laneway to be viewed as though peering over a fence into someone’s front yard. 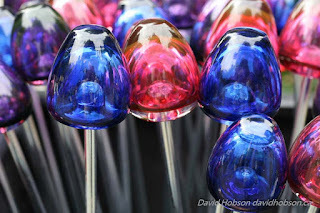 They are whimsical, filled with novelty, unique concepts, and countless ideas for the visitor to try at home. I’m always impressed by the unsurpassed attention to detail in these modest gardens. Moss-covered rocks slump in place as though they were born there. Rambling roses cling to drystone walls and wooden fences like long-lost lovers, despite having only just met. Laburnum trees, their rich yellow blossoms droop gracefully over a trickling stream. It would be difficult to replicate these perfect gardens in the real world, subjected to the vagaries of weather, but for a while at least, they spark the imaginations of all who view them. Plants are precisely placed according to colour, form, and texture, not a fallen petal or a yellow leaf. It’s not hard to imagine an army of garden gnomes working furiously overnight to ensure everything is flawless — except. Except garden gnomes have been historically banned from the Chelsea Flower Show, deemed unworthy, too kitschy. At least they were until the 100th anniversary in 2013 when the ban was lifted and gnomes made their appearance in all shapes and forms, even gnomish effigies of Will and Kate were represented. Plenty of garden kitsch is available from the 600 exhibitors in the market area, and throughout the rest of the show where only high-end kitsch is on display. Would you pay $50,000 for a bronze snail the size of a smart car? Maybe not, but for the discerning shopper, plenty of fine art statuary can be found. 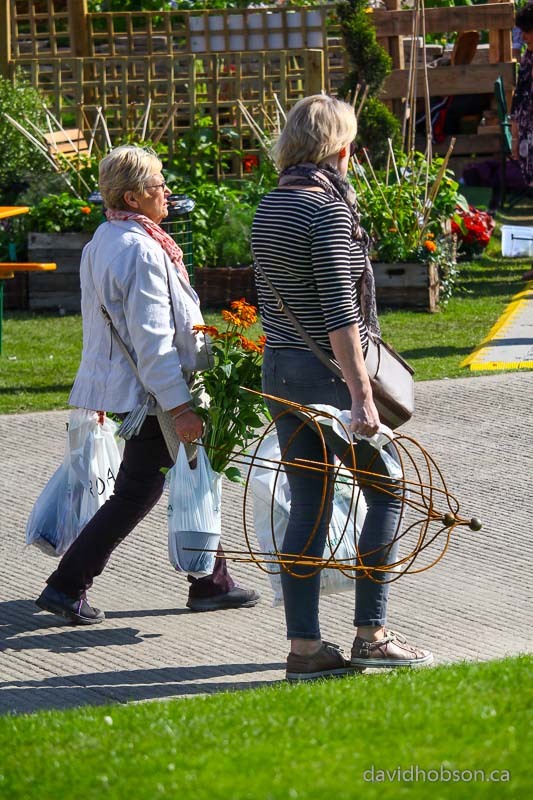 Time for shopping is essential for many show visitors as every possible garden-related product is available, from the latest elixir for plants to gazebos furnished in decadent style. The man from Dubarry of Ireland is always there, standing in a pail of water to demonstrate the waterproof nature of their exclusive leather boots. “Worn by country squires everywhere, he tells me.” Each time I’m tempted to trade in my old rubber wellies, but I always relent and settle for a packet of rare seeds, hoping customs don’t impound them. Rather than shop, I prefer to spend my limited time in the Grand Pavilion; a mind-boggling 1.2 hectare temporary structure impossibly jammed to the walls with the most amazing array of plants on earth, a symphony for the senses of colour and form. This is it, the plant lover’s fantasy world where superlatives are redundant. Your local paint store would be challenged to match all the hues, and that’s just the sweet pea display. All the specialist nurseries in the country are represented, competing for a gold medal, but not against each other. As in garden design, each medal is awarded based on meeting the highest of standards set by Chelsea judges — all or none might win. Foxgloves, which I struggle to grow in my own garden, tower above me over two metres high, while a massed collection of David Austin roses infuses the air. 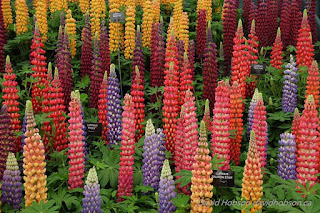 Leading lupin breeder, Sarah Conibear of Westcountry Nurseries in Devon, stops the traffic flow, having diced and sliced the rainbow even further in her quest for yet another gold medal. If you have a clematis clambering a wall in your garden, there’s a good chance it was bred by Raymond Evison, the clematis king winner of 27 gold medals. 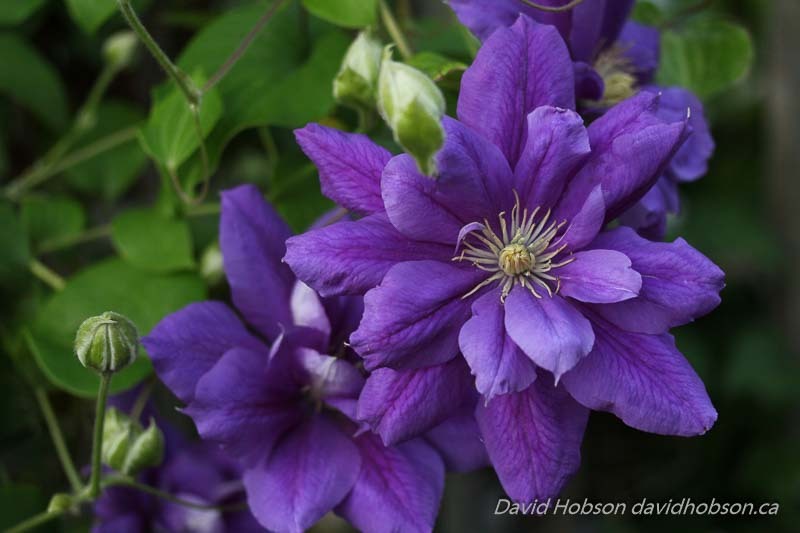 At his nursery on the Channel Island of Guernsey, Evison, one of the world’s largest producers of clematis plants, has bred over 100 new varieties. Every year he arrives at the show with at least one new cultivar. In 2005, he introduced Franziska Marie, a rich-blue, double-flowered variety named after his daughter. I immediately wanted to buy one to bring home, but alas, plant smuggling is frowned upon. I considered begging for a cutting that I could slip in a sandwich at the airport and pretend was lettuce, but instead I waited until the plant eventually became available in Canada. Even the British public are unable to purchase plants and immediately carry them away. Purchase they can, but they must wait until the close of the show to collect them, which happens precisely at 4:00 p.m. on the final day. A bell is rung to signal the end of the show and the start of the grand sell-off, the fastest way to clear the grounds of The Royal Military Hospital so that it can be restored to its original condition. Over the following five days, the beautiful gardens are dismantled. It’s rare that a complete garden is sold and relocated to a permanent site. In the 1950s, however, former King Edward VIII, the Duke of Windsor, is said to have enthusiastically helped move a complete rock garden to his private estate. More recently, the 2008 garden by Cleve West was moved to Meadbank Care Home in Battersea owned by the international healthcare group, Bupa, West’s sponsor. Otherwise, about 400 of tonnes of material has to be removed from the site. Large trees and shrubs are returned to the growers to be rehabilitated, smaller plants are sold off on site, while gravel, stone, concrete, and waste is recycled. Statuary will be returned or auctioned off for charity; meanwhile everything else is up for grabs. At the ringing of the bell, the garden gloves come off and the previously genteel patrons of the Chelsea Flower Show become avaricious rivals in a gigantic botanical Boxing Day-like sale. 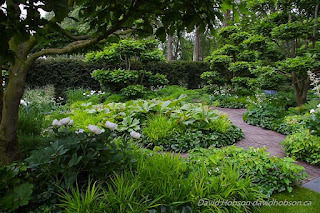 This is a feature of the show that I’ve not been present for, but it’s been described as a river-like flow of plants, shrubs and even trees filling the streets and sidewalks outside the grounds. 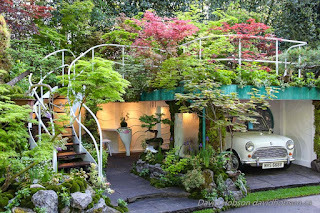 There, pedi cabs and taxis are summoned and buses become greenhouses on wheels as thousands of plants are dispersed throughout the gardens of London and beyond to grow on as a living reminder of the gardener’s amazing day at the show. Visitors from afar like me and my picnic table friends, unable to transport plants through customs, have to be content with inanimate souvenirs (surely not a gnome). Our memories and our memory cards, however, are jammed with images of thousands of plants singing in tune to concepts never imagined. This elevation of gardening as an art form will become inspiration for garden makeovers, or at least a new flowerbed with perhaps a hint of Tom Stuart-Smith or Cleve West in the design. In my own garden I barely have room for more plants, and my aspirations as a designer are limited to attempts at the perfect groupings and colour combinations I’ve seen. Often I fail, but each summer when my Franziska Marie first blooms on the arbour, I share with gardeners around the world the same excitement and joy we experienced at the Chelsea Flower Show. For some, one visit to the show may be enough, but for many, including me, the allure of rare plants, the sheer artistry of the gardens, the novelty and nostalgia, will always conspire to entice a return visit — at least one more time. Look, there are the newlyweds, Rupert Murdock and Jerry Hall, checking out the David Austin rose display! Wait, is that Piers Morgan? No, Peirs, you can’t take a selfie with me; I’m much more interested in the latest plant introductions. It was press day at the Chelsea Flower Show and lucky me had my coveted press accreditation, allowing me to preview the show prior to opening to the public. This is the one day when there are no crowds. Plants and show gardens can be viewed at leisure, apart from a little jostling with dignitaries or celebrities like old Piers. The Queen also attends, but we lesser mortals were cleared out before she arrived. To see the latest plant introductions immaculately displayed in the 1.2 hectare (three acre) Grand Pavilion and the ultimate in garden design outdoors is a jaw dropping experience for all who attend. This year there were seventeen large show gardens and thirteen smaller ones, each one a different concept created by designers with impeccable credentials. All compete for a coveted gold medal, awarded by the Royal Horticultural Society for meeting almost unattainably high standards. Beyond gold is the most prestigious honour of all — Best in Show. It was won this year by Andy Sturgeon for his Jurassic-inspired garden sponsored by the Daily Telegraph newspaper. The garden, focusing on how gardens may have to adapt to their environment and a changing climate, took ten months to design and used 80 tonnes of stone and plants from Spain, France, and Italy. 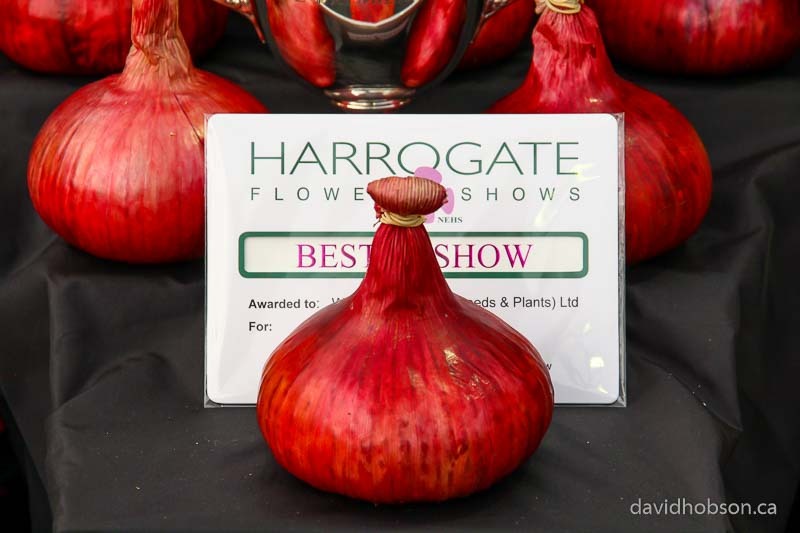 Perhaps equaling the honor of Best in Show is the People’s Choice Award, decided in a vote by the general public. It went to ‘God’s Own County — a Garden for Yorkshire’. Inspired by the magnificent medieval East Window at York Minster, it was characterized by a huge panel of stained glass made using the same techniques of the original window in 1405. The design of the window was then echoed in shape and form in the garden below. 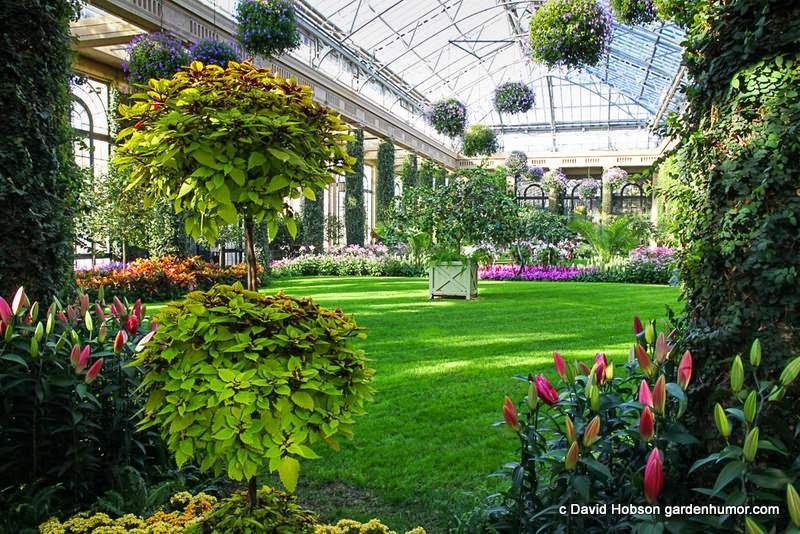 At first glance, all the gardens can be viewed as presented — to be simply admired or inspired. They are an outdoor gallery of living art that can, like any art form, elicit a range of emotions. Sometimes the concepts are clear, in others less so. ‘The Modern Slavery Garden’ with its brightly coloured front doors placed at random had a contemporary look, yet the designer used the doors to symbolize entry into a hidden world where people still work in captivity. There was no question or need to interpret the garden that greeted visitors at the entrance to the show. 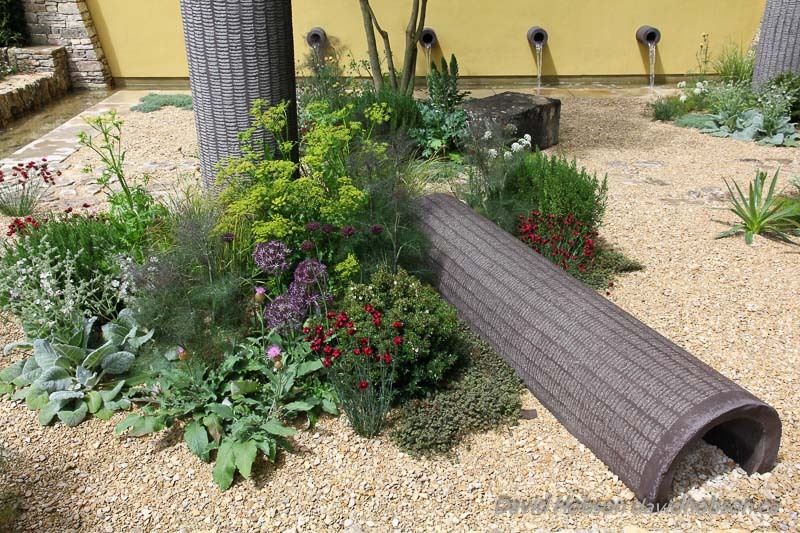 No gold medal this time around for designer Diarmuid Gavin of Ireland, a regular at the show who likes to shake up the judges with his surprising creations. The gardens at Chelsea may be living art, but this one was truly alive. As a group of musicians played the tune In an English Country Garden, in what appeared to be just that, the garden came alive as conical hornbeam trees began rotating, boxwood globes rose up slowly then lowered as a border of plants like a circus caravan circled a small cottage. Meanwhile a pair of window boxes ascended the wall of the cottage. Sponsored by Harrods department store, this was the British Eccentrics Garden. Okay, I thought, I thoroughly enjoyed that, but there’ll be some who’ll think Diarmuid jumped the shark this year. At the completely opposite end of the ostentatious scale was a garden that I could have easily passed by. Before what I took to be a large sculpture, people were standing or crouched as though praying. 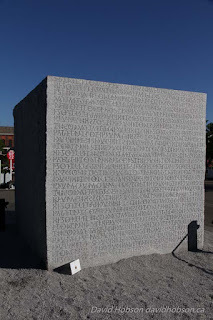 This was ‘The Antithesis of Sarcophagi’ a 44 tonne granite cube enclosing a small garden, a garden that could only be viewed by peeping through small holes drilled through the walls. Soon there was a line of peeping people, and at Chelsea, people watching is almost as much fun. 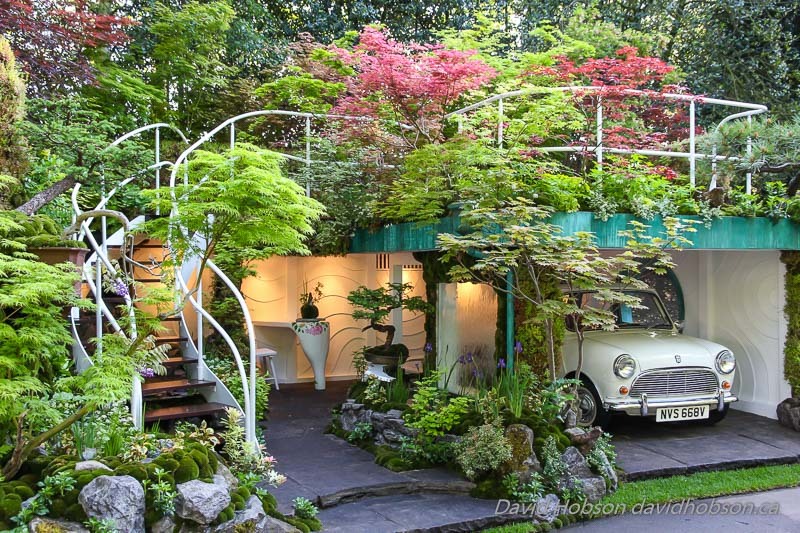 If I had to choose a favourite among all the gardens, it would be the ‘Garage Garden’ a gold medal winner by Japanese designer, Kazayuki Ishihara, who is as colourful as his garden. Lushly planted, it was an odd combination of a two tier structure housing an antique car, space for an office, and a roof top garden reached by a winding stair. Surprisingly it fused all these elements into a “wish I lived there moment”. 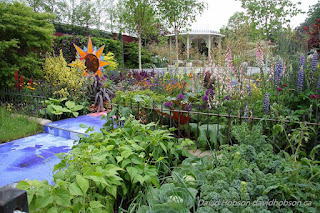 In fact, I wish I lived next door to the Chelsea Flower Show and could visit every day as there is simply too much to see, eleven acres of a plant and garden extravaganza to delight humble gardeners like me and Piers Morgan. It was a single red poppy in a field of wheat beside a busy parking lot that caught my attention. The solitary flower had a calming affect on me after having just spent too short a time whirling through Claude Monet’s garden. It’s a busy place, visited as it is each year by half a million art lovers and gardeners from around the world. Those are the two main reasons to visit — to see what inspired his art or the garden that Monet created — or both. In reality, it is hard to separate the two. I suppose I approached it as a gardener, but as soon as I stepped into the garden, it became less about plants and more about the images before me. 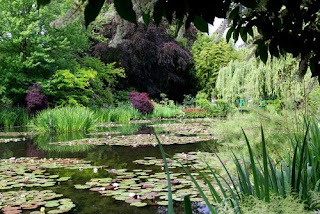 I felt I was strolling through a living gallery of Monet’s art. The sight of the oh so familiar water lily pond, however, featured so often in his paintings, managed to evoke a little gardener envy. The strolling pathway meanders around it, bordered by weeping willows, Japanese maples, bamboo and irises, allowing for a constantly changing perspective of the famous lilies. I crossed over one of the most painted and photographed bridges in the world beneath a huge blanket of wisteria. When in bloom a week or two earlier, the fragrance would have been heavenly. I skipped taking my own picture of the bridge, crowded as it was with pond viewers and left to enter the main garden. The two areas are separate, each a couple of acres in size divided by a busy road. Monet began developing the gardens after moving there in 1883, then ten years later bought the land across the road where he had the pond dug. He would only have had to dodge the occasional horse and cart, but distracted visitors can now cross safely by way of a tunnel. The garden is described as a Clos Normand, enclosed by walls and planted much as an English cottage garden filled with annuals and perennials and roses. Oh the roses — huge and healthy, masses of them all in bloom growing over arbors and walls, competing with clematis, fighting for space on the ivy covered house and filling flower beds. The beds are simple and not for the neatnik. They’re long and narrow and don’t meet any concept of current landscape design. They stretch down the gentle slope from the house, each one a slightly different palette from its neighbours, filled with endless clumps of plants chosen to contrast or complement in colour, texture, shape and size. It’s peak time for poppies, purple and mauve against a perfect shroud of Verbena bonariensis, just one example of Monet’s artistic skill. Monet sure knew his colours. Due to the number of visitors the narrow inner walkways between the beds are cordoned off, which is wise. Fill them with people and it would look like a checkout line at a garden center, and it would increase maintenance work for the gardeners, all eight of them. The head gardener is now British born James Priest who only started his job on June 1st, a couple of days after I visited the garden. He’s a 53-year-old Kew trained horticulturalist from Liverpool, but he has lived in France for 27 years. Priest has stated his intent is to ensure Monet’s concept is fully realized with a review of the original garden. After Monet died in 1926, the garden deteriorated and was eventually abandoned, the flower beds covered in turf and the pond soon filled with silt. Restoration only began in the late 1970s by Gerald van der Kamp, curator of the property with head Gilbert Vahe. His retirement after 35 years tending the garden opened up an opportunity for James Priest to take over. After only an hour or two there, I had to leave too, to return to my own garden where there are a couple of poppies waiting to bloom. There's many a gardener who will be looking out the window over the next few months wishing they were somewhere else. As snow falls and the piles beside the driveway grow ever higher, I know I'll frequently be daydreaming about my visit early this summer to the lost gardens of Heligan. The name alone conjures up evocative images of a romantic past. The place is stuck in my memory now as it must be in the minds of the thousands of other visitors that have made the trip through space and time to the most visited private garden in Britain. It is unforgettable. The story goes something like this: Early in the final decade of the last century, a couple of explorers, Tim Smit and his friend John Willis, made an expedition to the outer reaches of southwest England, Cornwall precisely, where they made an astonishing discovery. 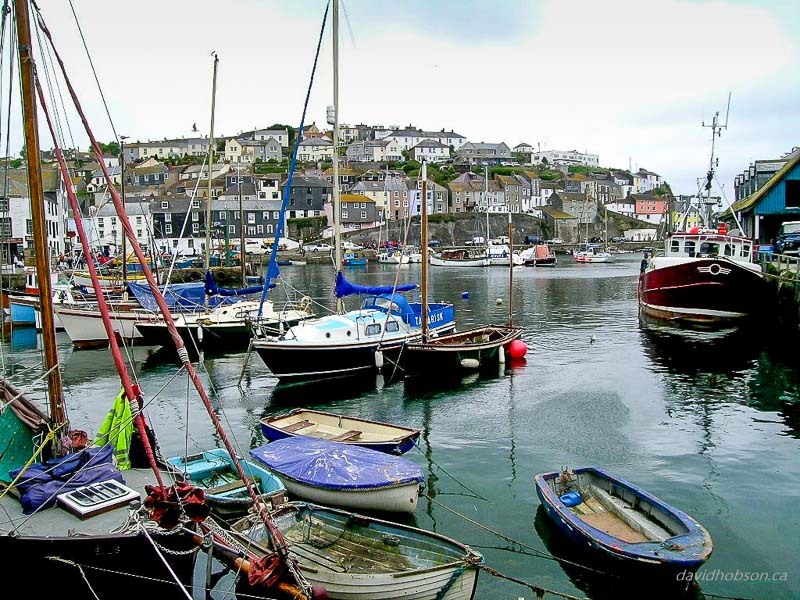 While in the tiny fishing village of Mevagissey, they heard rumours of a vanished garden in a tropical valley far above the village. Cornwall isn't tropical, but it is lush, wet, rugged country with a long history of pirates and smugglers, the kind of place where things can easily go missing, even a garden. Villagers on the Cornish coast have always been focussed on the sea, rarely venturing inland, except perhaps for a little quiet poaching occasionally, but no one would admit to that. By blabbing over a pint of cider in the Ship Inn about lost temples and wishing wells up the valley, a poor fisherman might just as well admit that he'd been out chasing game on the estate of the local Squire. Instead, the stories were whispered. But these hints and whispers gained a life of their own, as rumours do, and intrigued, Tim and John, following the hidden paths of poachers, set out to explore the valley. They were amazed to discover palm trees and bamboo, and as they pushed upwards through tangled undergrowth and overgrowth, they soon found themselves crawling on all fours beneath huge, overgrown shrubs and laurel hedges, their way blocked in places by massive brick walls, derelict stone structures and broken glass. I imagine their strained conversation was along the lines of, "I say, Tim, aren't those thingies the gnarled branches of the extremely rare Rhododendron prunifolium, native to the Himalayas, and what the Dickens is it doing here in Cornwall?" On that day, February 16th, 1990, our two sunny afternoon explorers had discovered the gloomy ruins of Heligan Gardens, lost in time beneath seven decades of rampant growth. Acres of themed gardens, grottoes, and a treasure of Victorian follies awaited them. Over four kilometres of footpaths would eventually lead them to a hectare of walled kitchen gardens containing the melon frames and pineapple pits that had supplied the estate with exotic fruit. 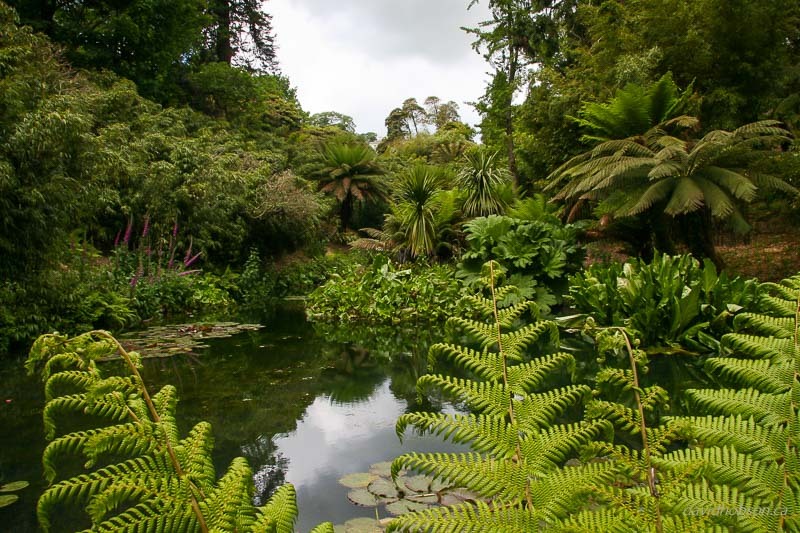 All about were hundreds of rare plants from around the world, overgrown specimens from the original collections of the garden's founders, the Tremayne family. 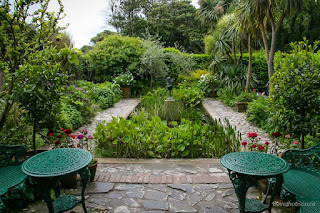 The area had been under the stewardship of the Tremaynes since the mid 17th century, although the first true gardens were largely created during the 19th century. 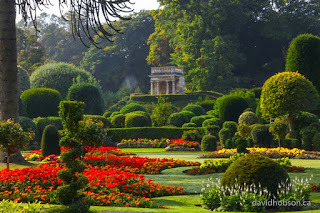 They became one of the finest in England of the period, with 23 hectares of planted gardens, around 40 hectares of ornamental woodlands, and riding trails crisscrossing an area of 120 hectares. It was a remote oasis of tranquility. But when war broke out in 1914, the outside world forced its way in. 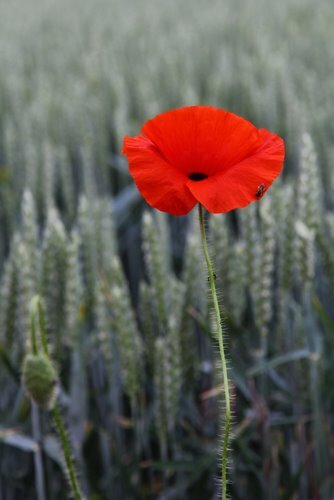 One by one, the large staff of gardeners joined the Duke of Cornwall's Light Infantry and left for the trenches on the battlefields of Europe. Most never returned. Their names can still be seen today, scratched into the walls of Heligan. By 1920, fortunes had changed for the Tremayne family. The house was leased, the land neglected, and the gardens of Heligan simply rolled over and slept beneath a blanket of ivy and bramble until the day Tim Smit and his friend arrived to awaken this idyllic place. Thus began the largest garden restoration project in Europe. The result is a time capsule of a forgotten era, faithfully restored to its original majesty. A gardener visiting the Gardens of Heligan today can indeed travel through time and see this wonder almost exactly as it existed over a century ago. I did and I can't forget it. In 2012, I took a short trip to see family in the UK. While there, as always, I try to visit a garden or two. Many of the most popular and visited gardens in Britain are on the tourist route in the south; places like Sissinghurst, Hidcote, and Great Dixter, all conveniently within easy reach of London. But across the country are countless stately homes, mansions, and castles that have opened up their magnificent gardens to the public. I spent my time north of London, in Yorkshire, somewhat off the beaten track when it comes garden tourism. 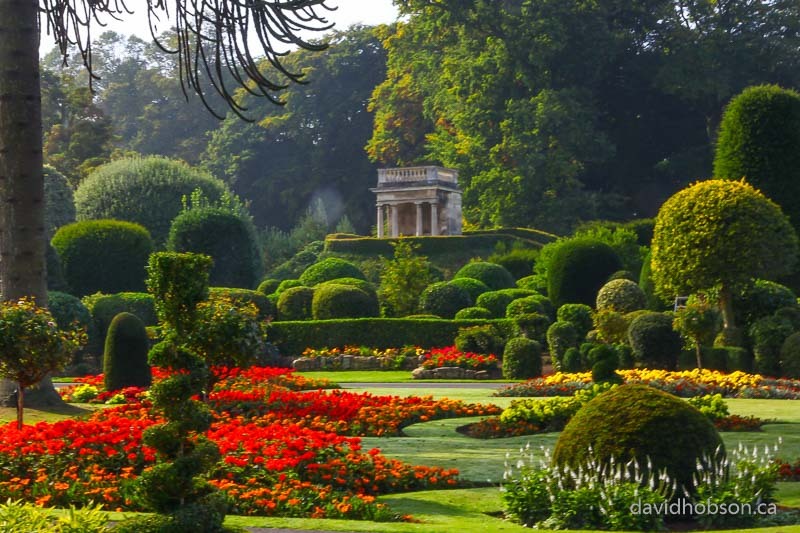 Fall may not be ideal for visiting gardens in Britain as June is the peak time, but it has its rewards. There may have been fewer blooms and blossoms to see, but the subtle colours of early fall and the form and structure of historic gardens were present. I was able to wander at will, almost alone along woodland paths, through formal gardens, and across pastoral countryside. I visited a couple of locations, all within an hour or so of my base. First was Wentworth castle in South Yorkshire, established in the early 18th century by the Earls of Stafford. It’s not a traditional castle, more of a massive mansion, used now as a college, but the glorious gardens are recognized for their collections of rare rhododendrons, magnolias and camellias. These are set in gently sloping parkland filled with ancient trees, rockeries, stumpery, secret Victorian flower gardens, and at the head of the park an impressive ruined folly in the form of a traditional castle complete with crenelated walls and towers. 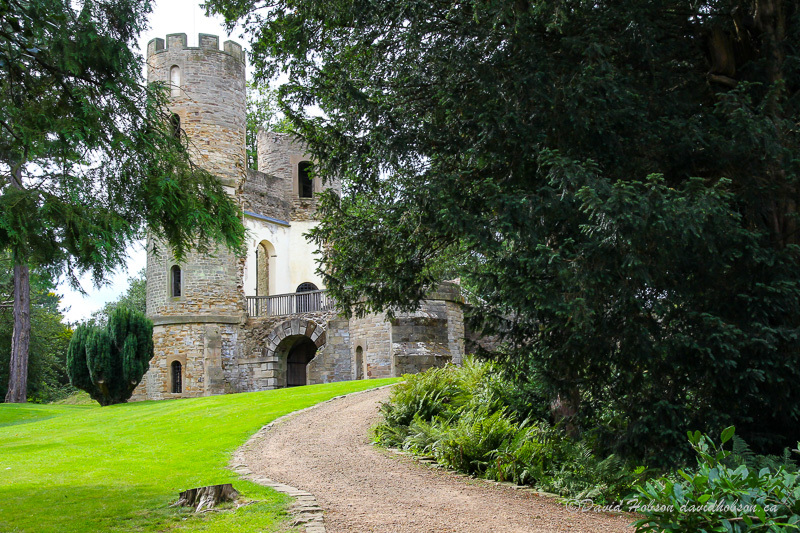 One of the four towers is intact and provides an exceptional view of the 30 hectare estate and surrounding countryside. Far below I could see Lady Lucy’s Walk, an impressive avenue of lime trees planted in 1920 in honour of Thomas Wentworth’s daughter, said to have died of a broken heart after being forbidden to marry her beloved. I guess that’s what you get for falling in love with the estate gardener, rather than a preferred member of the aristocracy. Hope they didn’t make him plant the lime trees. 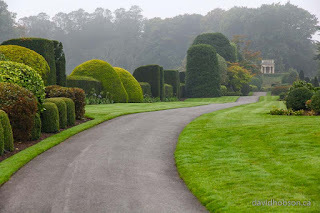 My other visit was to Scampston Estate, in north Yorkshire, and it is a delight. The principle feature is a four and a half acre (almost two hectares) nineteenth century walled garden. It lay derelict for fifty years until 1999 when the current owners, Sir Charles and Lady Legard, took on the task of renovation by contracting renowned Dutch designer, Piet Oudolf. He created a beautiful enclosed garden made up of rooms, each one a different concept. I passed through each one, back and forth, finding surprises at each turn: a perennial meadow, serpentine hedges of yew, drifts of grasses, a Katsura grove, and the Silent Garden. It’s filled with stately pillars of yew mirrored in a pond. One corner has a conveniently placed mount designed to provide an elevated view of the whole garden. And then I traveled through time when I passed through the garden gate into the 80 acre (32 hectare) parkland beyond, a rare landscape designed two hundred years earlier by Capability Brown. What a contrast. It’s a vista of lakes and streams, copses of trees and solitary giants planted in the naturalistic style of the time. It may have been fall, but a blue sky filled with billowing white clouds and a soft breeze to set the grasses in motion, followed by tea and cakes in the cosy restaurant, and I knew I’d found my way to a gem of a place, a successful combination of the old and the new. Drive thirteen hours just to look at a garden? Are you crazy? Some might think so, but not serious plant and garden lovers. Sooner or later they all add this one to their list of gardens to visit. It’s been on my own list for years but I never got around to it until last week when I suggested a road trip to fellow gardener, Mat. 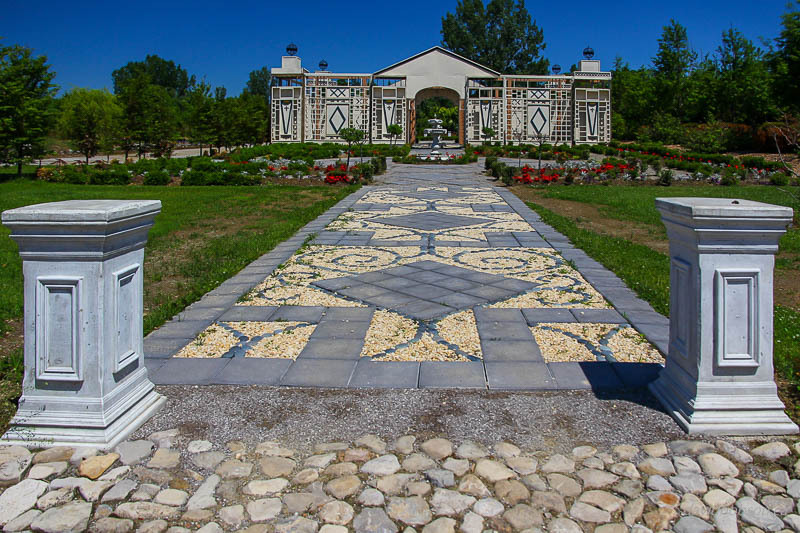 The garden in question is Reford Gardens, also known as Le Jardins de Métis, an English-style garden on the banks of the St. Lawrence near Grand-Métis, Quebec. This historic garden, on the site of a family fishing camp, was created in the 1920s by Elsie Reford, and has been open to the public since 1962. 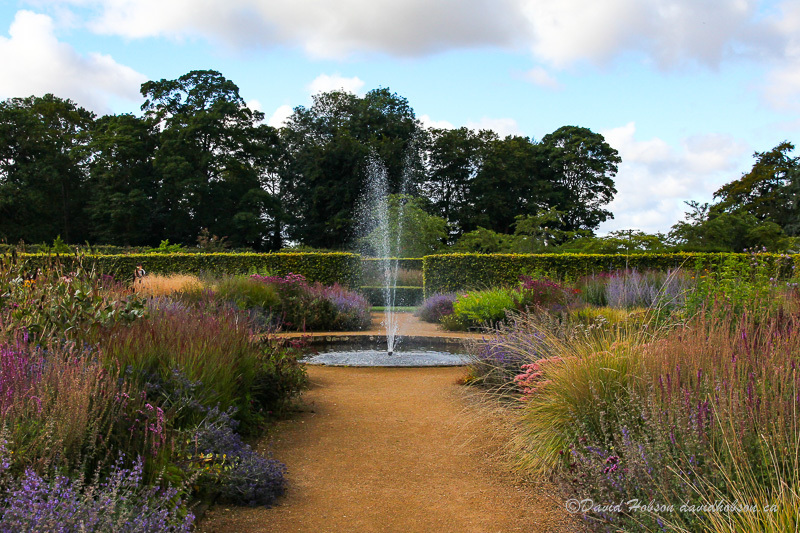 The twenty acre garden, now under the care of her grandson, Alexander Reford, has become a magnet for gardeners intent on seeing this remarkable place. 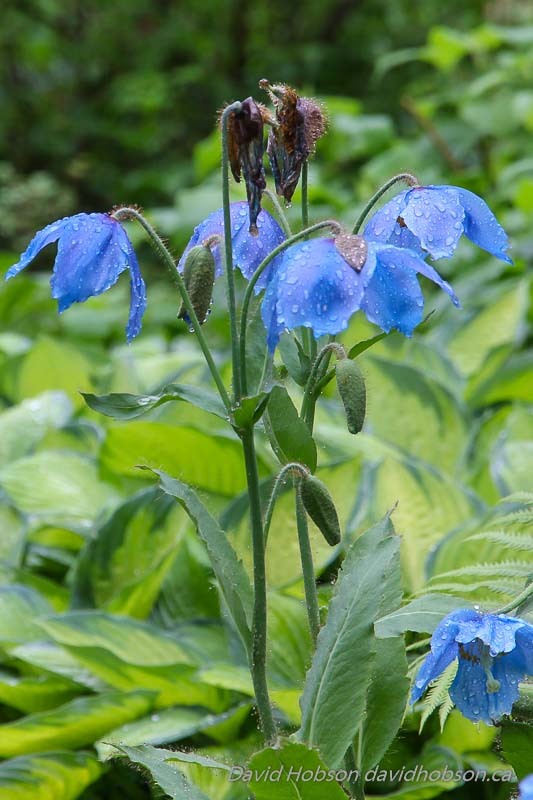 Many are attracted by the hope of seeing the famous blue poppy, Meconopsis betonicifolia — and of course, a sublime garden filled with thousands of other notable plants. This is why Mat and I were on the road at 4:30 a.m., with a 1200 kilometer drive ahead of us. After a stop to see the roses in the Montreal Botanical garden, we arrived in Metis-sur-Mer just in time to watch a beautiful sunset over the St. Lawrence. We hoped that it portended a sunny day for our garden tour. Alas, daybreak brought torrential rain and thunderstorms. There was little to do but wait in our hotel, Domaine Annie Sur Mer, for the weather to clear. It didn’t, but we hadn’t travelled all that way to sit around looking out on grey skies and grey water, so after reminding (or maybe convincing) ourselves that gardens always look best on cloudy, even rainy days, off we went. Our somewhat damp enthusiasm was rewarded when, as we entered the garden, the rain eased then stopped completely — what a gift. There was no sunshine but we were beaming as we walked through a still dripping spruce forest along puddled pathways and over the wooden bridges that crisscross the small creek. It was here that Elsie Reford created the heart of her garden. The pathways wind by the moss covered stone walls she built to stabilize the steep slopes. 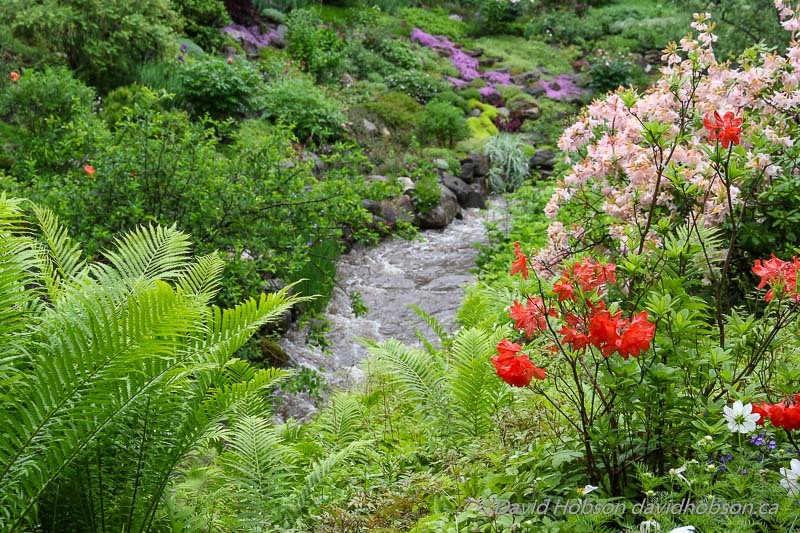 Azaleas of yellow and orange lit up the forest as masses of candelabra primula spilled down to the edge of the creek. Everywhere, forest-dwelling ferns gently softened the colourful plantings. Okay, I could go on about countless gorgeous plants — and of course the amazing blue poppies, but there’s so much more to this garden, including a lupine filled meadow. A major attraction are the twenty-seven other gardens currently in place as part of the annual garden festival that makes Reford Gardens a unique horticultural tourist destination. These conceptual gardens, many of which are permanent, are created by designers from around the world. Artistic and sculptural, they’re designed to amaze, evoke, and puzzle over — ever seen trees other than in of Lord of the Rings that move across the forest floor? We did. 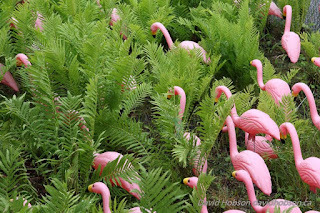 There was even a place for that blight of gardens everywhere, pink flamingoes. At Reford they were delightfully displayed in The Veil Garden as a flock advancing through ferns. I may have to consider finding room in my own garden for a few — or maybe in Mat’s garden. They came with their bags and boxes, wagons and wheelies, all prepared to haul home the perfect plant, piece of statuary or garden accessory. This was the Harrogate Autumn Flower Show, three days in September in the North of England where gardeners have the final opportunity to satiate their garden needs before the season ends. Whether it’s the latest pruning tool, antique planter or the rarest of shrubs, it’s all available — in spades (groan). There was even a plant and product crèche for the temporary deposit of heavy purchases rather than lugging them around the show. 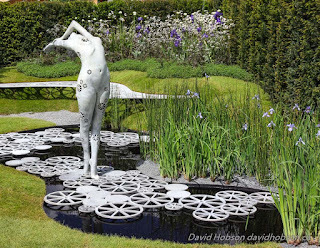 Unlike the well-known city garden shows of summer — Chelsea and Hampton Court — with their elaborate, hugely expensive show gardens; this was brass tacks, no guff gardening. I was there to see it all on a perfect sunny day in the greenest of rolling countryside in Yorkshire. With a brass band playing and my favourite traditional food available, I was at home. Okay, I’m a tad biased having grown up there and I was lucky it wasn’t raining, but I thoroughly enjoyed the experience. Besides the essential shopping aspect of the show, it is the place to view displays of: the longest carrots, beets the size of cabbages, cabbages the size of pumpkins, and every possible variety of perfect apples. As for the flowers, I gaped at absolutely immaculate specimens of delightful dahlias, mini mums and monster mums, the finest of fuchsias, and don’t even ask about the roses. Glads and bonsai, geraniums and delphiniums, all were challenging for best in class, the result of months of intensive care by amateur gardeners in countless tiny backyards and allotments (community gardens). Plants for sale were in abundance, and at the right time for planting in the garden. 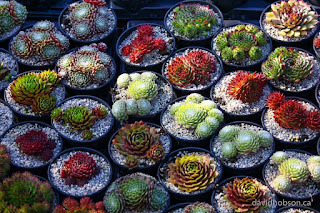 I saw a few that I would have liked to bring home, but alas, customs restrictions are still in place for the importing of plants. Instead I settled for a selfie with a new coreopsis, one that I’ll be on the lookout for over here. Fascinating were the novel approaches to garden adornments — a life-size shire horse constructed with strips of branches shorn of bark — imagine that galloping across the rose garden. Increasingly popular are vintage stone troughs, originally hand hewn with hammer and chisel. My dad had a collection filled with alpine plants. Once used to capture water or as troughs for animal feed on hill farms where stone was abundant, the old ones are rare and much sought after, but now they can be reproduced by mechanical means. Since the stone is the same, it’s hard to see any difference between those and the traditional ones. Galvanised planters appear popular too, just as they are around my place. One dealer appeared to have rounded up every possible metal artifact that could possibly hold soil, the original function of some hard to discern. There is much tradition around gardening in Britain; though one that is fading is the use of peat in the garden. The government proposes to ban the use of peat based products by 2020 as harvesting it is considered environmentally unsustainable. 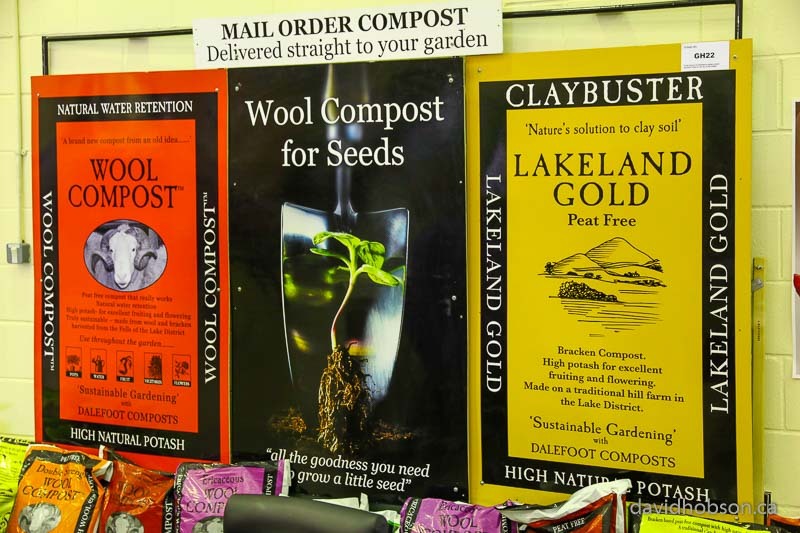 The Royal Horticultural Society has already reduced the use of peat in its own gardens by 90%. 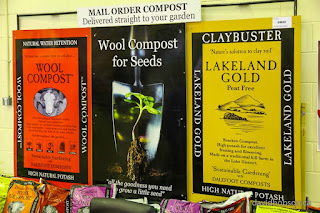 There are alternatives and I spotted a couple of peat free potting soils — one produced from composted wool and the other from composted bracken. The latter is produced in the Lake District and aptly named Lakeland Gold. Of note is they were both labelled as compost, the term used in Britain for potting soil, not to be confused with compost produced by a compost pile. This short glimpse into to the heart of British gardening was delightful, but now it’s time to sort out my own garden. It doesn’t handle neglect well at all. On a cold January day, I find myself reminiscing about a garden I visited, where for a while I stepped back into the nineteenth century. It began when I came upon Victorian croquet players dressed in traditional white. Like ghosts, they began to emerge in soft focus from a light morning mist. This was last fall whilst visiting Brodsworth Hall near Doncaster in south Yorkshire. Both house and garden are remarkable, though not so well-known as those on the well-travelled tourist route in the south of England. 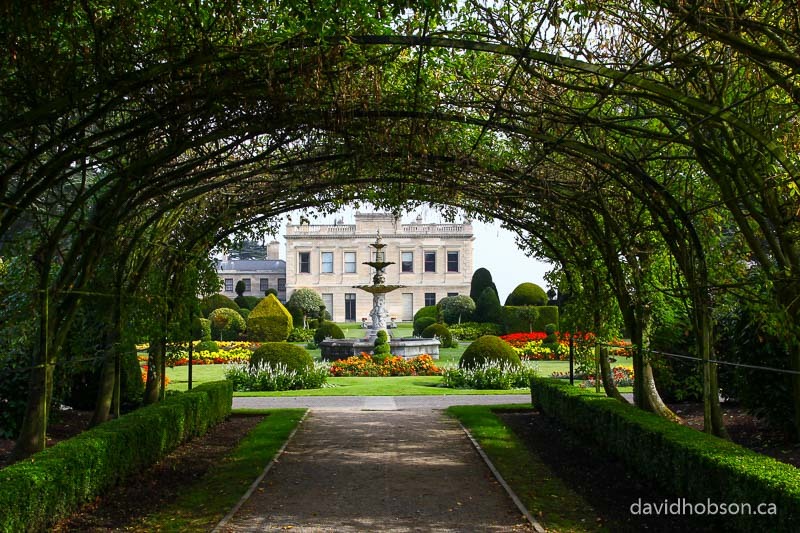 Brodsworth was built in the 1860s and has a curious history with a plotline well suited to the Downton Abbey saga. The original estate was owned by the Wentworth family until sold in 1790 to Peter Thellusson, a director of the Bank of England. When he died in 1797, his will stipulated, without explanation, that his fortune was to be held in trust for three generations, the eventual beneficiary being Charles Sabine Augustus Thellusson, a great-grandson. Wealthy Charles immediately demolished the original Georgian house and built a modern Victorian mansion complete with marvelous gardens. It stayed in the family relatively unchanged until 1990 when the estate was acquired by English Heritage, an organisation that manages historic sites. Today the house and gardens are a unique time capsule of Victorian style. The 6 hectares (15 acres) of gardens suffered neglect for a period after WWII, but have since been restored to their original Italianate-like 1860s design, popularised in Britain after Victorians returned from grand tours of Europe. Around the imposing, grey limestone house are spacious lawns, which were said to have been mown in earlier days by machines towed by ponies wearing special leather shoes to prevent damage to the lawns. From a marble terrace I watched the croquet players at their game, surrounded by formal flowerbeds filled mainly with annual bedding plants. These are meticulously maintained and replanted as many as four times throughout the seasons. In September they glowed brightly with red salvia and yellow marigolds. Hundreds of densely planted evergreens completed the vista — holly, laurel, and yew. 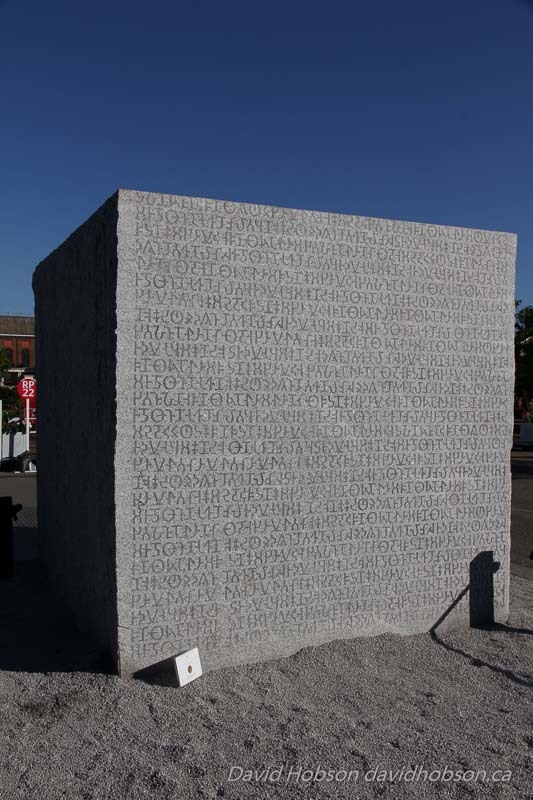 Every single one perfectly sculpted into simple, random mounds and columns with the occasional precise geometric shape. 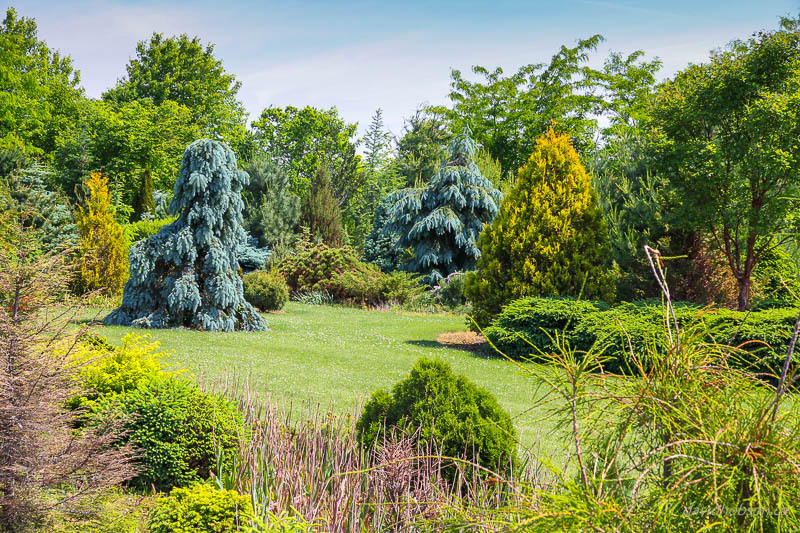 Beyond the extensive topiary stands a backdrop of mature trees — massive pines, cedar, beech, and the unusual Chilean pine called the monkey puzzle tree. Many of these would have been planted long before the current garden was developed. 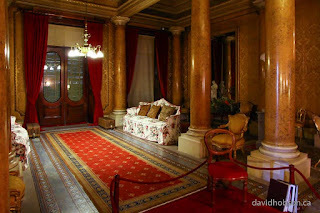 Everywhere, classical statues, fountains and urns, in marble or stone, graced the pathways. I followed one meandering trail that led me to the renowned grotto and its river of white gravel bounded by alpine plants. Masses of ferns grow on the steep, rocky sides, including palm-like Dicksonia tree ferns. Winding paths led me through short tunnels and over bridges, the parapets bordered by loops of iron chain draped with rambling plants. 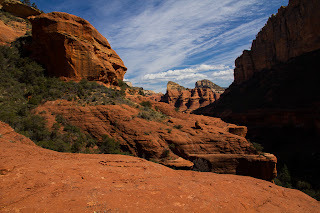 Each stop provided a different vantage point to pause and admire the ingenuity. Nearby I wandered into a pet cemetery where I spent a few quiet moments among small headstones, each one etched with the name of a treasured friend — Dash 1895, Spot 1906, Tatters 1919. I then climbed a small hill past an ivy covered summer house, to a lookout from where, with the mist risen, I could see even more of the gardens inviting my exploration. From the hill I made my way down into the still fragrant wild rose dell, through the walled garden, then followed the woodland pathways for a while with only the clunk of a distant croquet mallet to disturb the glorious silence of this nineteenth century garden. It was a lovely day, but sadly, dreaming is over now as all I hear is a twenty first century snow plow coming down the street. This summer I again made my way down to Whistling Gardens, Canada’s newest botanical garden. Located just south of Brantford, it’s the creation of former outdoor education teacher and tree propagator, Darren Heimbecker. After visiting many of the finest botanical gardens in Europe, Darren was inspired to create his own, practically on our doorstep. Nine years ago he bought a farm which up until four years ago was still growing corn. He then began converting the land from agriculture to horticulture. He readily admits it was an immense challenge and a struggle at times, but this unassuming man fulfilled what many would consider the wildest of dreams. This is only the second year the gardens have been open and word is already spreading rapidly about this unique property. Currently, eighteen acres are cultivated and now contain the largest public collection of conifers in the world. 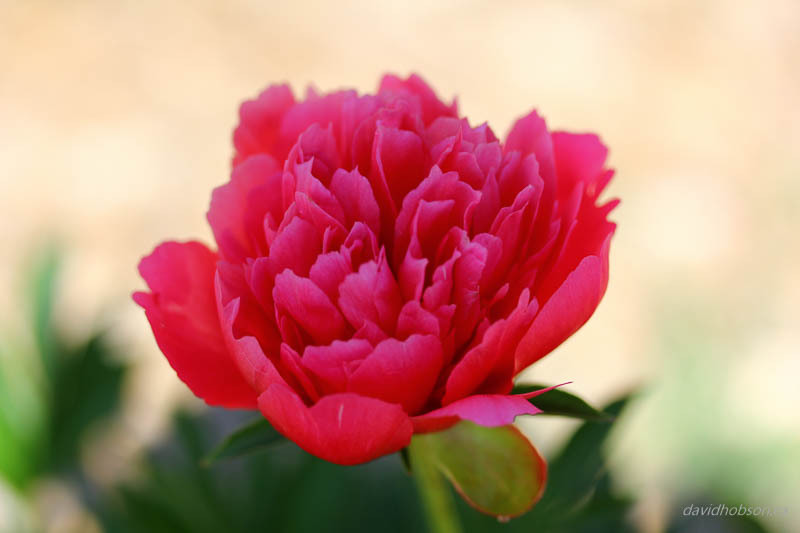 Over 2,400 species, hybrids and cultivars are planted and thriving. Ideally situated within the Carolinian forest region of the province, the garden is perfectly suited for growing unique species, some among the rarest in the world. Among them is Abies beshanzuensis, a fir tree that was only discovered in 1963 in China. Today, only three survive in the wild, although a limited number have since been propagated. Another unusual tree, a larch from Japan — Larix kaempferi ‘Diana’, has branches that twist and contort as it grows. Pine trees from Mexico, a variegated oak from Britain, there’s a whole forest of fascinating trees. In the rock garden, with the 2,000 or so bulbs that flower there in spring, including a blue river of grape hyacinths, there is a collection of dwarf conifers that are more suited to the suburban garden than the potential giants planted around the property. The rock garden features equally rare perennials, including Dianthus freynii, the first one I’ve seen. It’s the smallest of pinks with tiny leaves that form a mossy, tufted mound that invites you to reach out and pet it. The rock garden, with a section dedicated to fossils found locally, is just part of the landscape. Did I mention the hundreds of varieties among the 3,000 perennials? The huge clumps of Asiatic lilies, unsullied by the pesky red lily beetle, were prominent. Complementing the perennials, Darren manages to slip in 5,000 annuals to add to the show. Besides the conifers, Darren’s collection of deciduous trees is on the increase with 40 varieties of Cornus (dogwood) and thirty, yes thirty magnolias. A new addition is Acer capillipes, the snake bark maple with its strangely patterned bark. This, like other introductions are undergoing evaluation as they are being grown for the first time in Canada. At every turn there is something unique to see. Almost four kilometers of pathways take in the Temple Garden where wedding ceremonies are held, and a fountain amphitheater where over 100 jets of water perform to music (composed by Darren). Water features abound and include a lake with swans, a hidden pond, and a Marsh Garden based on one that existed at Versailles. I finally had the opportunity to attend the Hampton Court Palace Flower Show back in July. I’ve been to the rival Chelsea Flower Show a number of times with groups, but never Hampton, so this time I took the opportunity while visiting family in the UK in Yorkshire to zip down the motorway to London for the show. Given the traffic jams the show generates, the zip kept sticking, but thanks to a 4:00 AM start, my daughter and I made it for opening time. Up at 4:00 AM to see flowers? Yes, but these shows, despite the name, are about much more than flowers. 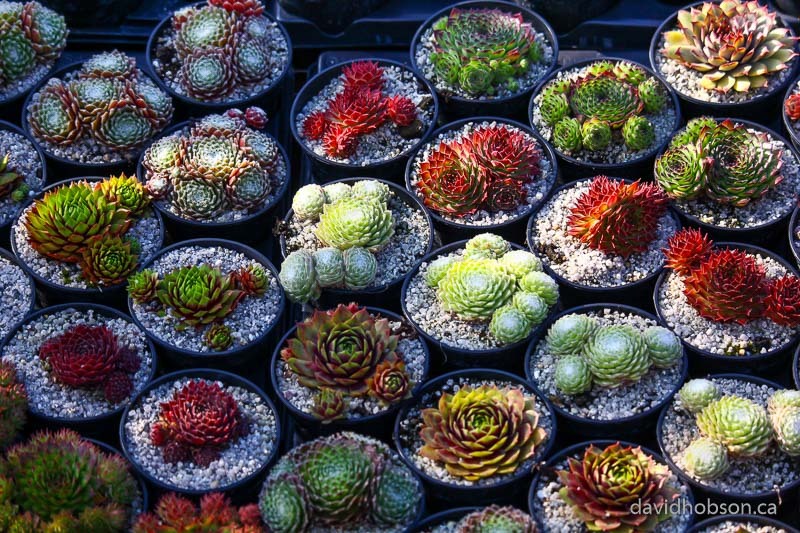 They’re like Mecca for gardeners, top of countless bucket lists. They feature gardens designed by the world’s best, the very latest in new plant introductions, and more garden paraphernalia to purchase (including buckets) than one could possibly imagine. The shows, both presented by the Royal Horticultural Society, are similar in content though held at different times of year — Chelsea in spring and Hampton in summer — which means the floral content differs, and at 25 acres (10 hectares), Hampton covers an area more than twice the size of Chelsea. The latter is in the heart of London where it’s easier to access by public transportation, and with a capped attendance it does seem easier to get around. Due to the sprawling nature of Hampton and the afternoon crowds streaming in, we did leave uncertain that we’d seen absolutely everything, but did see plenty. As expected, the display gardens were immaculate; colours divinely coordinated in the most surprising combinations that looked perfectly matched. Never again will I say two particular colours don’t look well together. One group of gardens used colour effectively to interpret a specific theme, that of the seven deadly sins. The theme of anger was indeed blazing mad with Japanese blood grass, the grass interplanted with reds and oranges of yarrow and echinacea pierced by golden spikes of kniphofia, all in a bed of smoking lava. Gluttony was amusingly represented by giant food cans used as planters, the sardine can appropriately a water garden. The concept for envy was depicted by a grassy meadow in shades of brown. On a mound in the centre, enclosed by a screen of green Perspex, a lawn of artificial grass clipped to perfection — the grass is always greener . . . These were the conceptual gardens while others were categorized as summer gardens, large show gardens (Australia took a gold), and smaller ones described as your garden, your budget. These modest gardens were designed to demonstrate how a high quality garden can be achieved on a budget; the budgets for these ranging, ahem, from twelve to twenty-five thousand dollars. I may never look at a cell pack of annuals the same way. Those attending the show with a far less restrictive budget than me had plenty of opportunity to spend wildly. I was tempted, but had to pass on the giant bronze statue of a snail and the huge stone horse trough planter due to my flight baggage limit. I left the show with only a freebie packet of seed (Ammi majus). Beyond the gardens and market place of the show, there were wonderful learning opportunities. A number of plant societies were present offering their specialized knowledge, while a display by the RHS called the invisible garden contained a number of interactive displays with microscopes. It encouraged visitors to discover the fascinating unseen world of insects, fungi and the myriad of other creatures that are invisible, yet so essential to a garden. There was so much to see and so little time as the zippy motorway home awaited us. It was worth the drive. Well it wasn’t an act of desperation, but driving ten hours to see living plants might appear that way. It all began with a suggestion by Rodger Tschanz, who many know as the fellow who runs the plant trials at the University of Guelph. “How about a road trip to see the Philadelphia Flower Show,” he said. “Why not,” was my reply, so off we went last week. Was the show worth a ten hour drive? Absolutely, but mainly because Rodger had a side trip in mind that ensured the journey was memorable. As for the show, it is the one that inspired the original organizers of Canada Blooms. The concept is much the same, but the Philadelphia show is larger with a wider range of plant material that is easily shipped in from the south. We trekked through the show Monday evening and Tuesday morning, and certainly enjoyed it, but then we headed to Longwood Gardens, about a forty minute drive west of Philadelphia. I’d heard much of the place, and heard it was impressive, but I wasn’t prepared for what I would see. Certainly, the 1,000 acres of gardens were snow covered as ours are, but the 20 indoor gardens covering 18,200 m² (4.5 acres) were open for visiting. 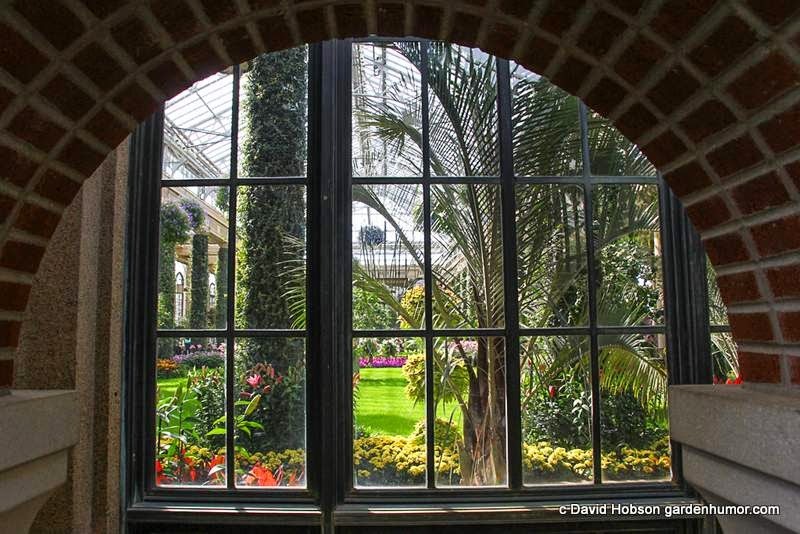 These were the famous Longwood conservatories and they are truly magical. I’m not much of a lawn lover, but to see a lush green one in the middle of winter bordered by beds of clivia and bromeliads, is a sight to behold. This was the main conservatory, originally built to house an orangery. It’s the largest of the 20 areas under glass. Eight indoor gardeners along with volunteers ensure absolute perfection of the floral displays that transform with the seasons. Birds sing and water softly burbles, while in the orchid house, 500 plants fill the air with fragrance. Orchids? We just happened to visit during Orchid Extravaganza (runs until March 30th) when nearly 5,000 orchids adorn columns and hang from baskets with a few thousand more as backups should a petal fall. 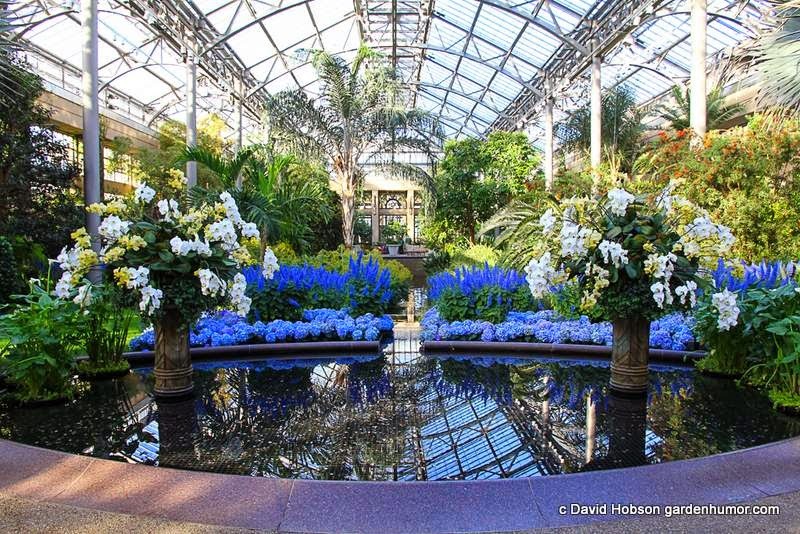 Meanwhile in the East Conservatory blue predominates with masses of hydrangeas and spires of Plectranthus thyrsoideus. In any other place, a Bird of Paradise would stand out, but here it is challenged by too many other stars. I particularly liked the Winter Red-Hot Poker plant, not our common orange variety of Kniphofia uvaria, but Veltheimia bracteata, an entirely different species in pink and white. We covered most of the half mile of pathways and passages, passing through the Silver Garden, Acacia Passage, Cascade Garden, Palm House, and Mediterranean Garden, marvelling all the way. The following morning we returned, and whilst Rodger, who once spent a week here as a volunteer, met with colleagues to discuss tissue culture techniques, I had the good fortune to be turned loose in the conservatories before they opened for the day. Alone except for the few gardeners, I was free to wander at will, putting miles on my camera. What a gift. And who gave this gift? It’s all thanks to industrialist Pierre S. du Pont (1870–1954), heir to the family fortune of the DuPont chemical company. He acquired the property in 1906 to save an existing arboretum, then went on to create the gardens and build the conservatories. Longwood is now operated as a private trust, and in addition to the gardens it offers educational opportunities through its graduate program and internships. It also hosts hundreds of arts and horticultural functions each year. Now I’ve seen what Longwood offers indoors I must return some day to see the outdoor gardens. Sure, it was a long drive, but with the winter we’ve had it couldn’t have been a better time to visit — serendipity. Good idea, Rodger. I was in Quebec City for a few days this summer attending the annual Garden Writers Association Symposium. I met a lot of people, attended a number of presentations, and was introduced to new garden products. It was all good fun but the best part, besides touring a number of historic gardens, was wandering about the old city. In was like a homecoming for me as the last time I was there was over 40 years ago when I hopped off a boat from England to be processed. I don’t recall much from that time, but I’m sure the city wasn’t nearly as attractive and flower filled as it is now. Since then, the old city has been designated as a world heritage site, and it’s a delightful place. The narrow streets are filled with countless hanging baskets and window boxes. The public gardens are immaculate, particularly those in front of the Quebec National Assembly. Colour rich flower beds radiate from the Fontaine de Tourney, a massive cast iron fountain donated to celebrate the 400th anniversary of the founding of the city by the Simons family, owners of Quebec City’s oldest department store. The fountain, found in a Paris antique shop, originally stood in Allées de Tourny, Bordeaux, France from 1857 to 1960. Now fully restored, it is an impressive work of art enhanced by the quality of the gardens. 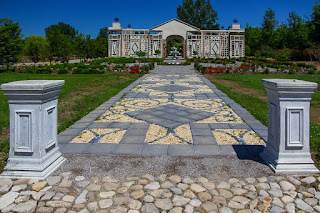 To see rare plants, I recommend a visit to Université Laval's exceptional Roger-Van den Hende Botanical Garden, but the familiar annuals and perennials in these flowerbeds were perfectly planted and maintained, and some of the finest specimens I’ve seen anywhere. This was also apparent in the Joan of Arc garden located on the Plains of Abraham. The garden, an elongated octagon about a couple of hundred meters long was established in 1938 to accommodate a huge bronze statue of Joan of Arc mounted for battle, a gift to the city presented anonymously from an American artist and her husband. The garden was designed by landscape architect Louis Perron and is sunk a few feet below the surrounding area and flanked on all sides by magnificent American elm trees — yes, elm trees. Within the garden are over 150 species of plants incorporated into a design that cleverly blends the precision of the French Classical style with the less restrained British style of gardening — mixed beds in all combinations of form and colour — which I think reflects the makeup and essence of this country quite nicely. Thanks to the elevation difference, it allows for a two tier planting scheme along the perimeter with colourful annuals swirling and flowing in intricate patterns throughout the perennials and small shrubs. 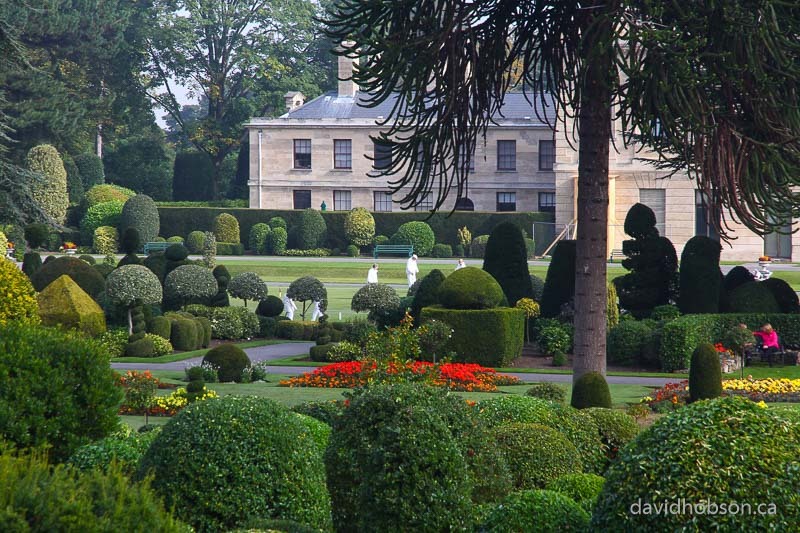 As befits a historic public garden, the plants are of exceptional quality. Even though I have many of the same perennials in my own garden — Echinacea, Veronica, Aconitum — they seemed so much bigger more robust. I suspect this has much to do with the climate of Quebec City. Summer is a little cooler and shorter, and like the people of the city, plants make the most of it. Slightly longer days also promote more growth, but the deep snow cover that reliably buries the perennials each winter means they are well protected at root level, barely freezing. This is so different from our corner of the country where January thaws expose our plants, frequently freezing and thawing them only to be broiled and baked in summer. Okay, I’m envious, but despite excellent growing conditions and beautiful architecture, I’m not planning to move my garden. I am, however, looking forward to another visit, and I don’t think I’ll be waiting another 40 years. It's all about timing. My trip to the Chelsea Flower Show and gardens in the UK this year occurred after that country experienced the coldest spring in fifty years, and yet rhododendrons and azaleas were in full, glorious bloom coinciding with my visit. 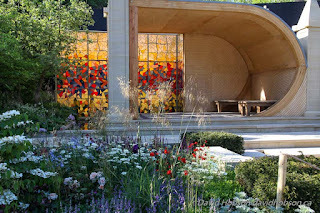 The effect of this exceptionally late spring wasn't apparent at the Chelsea Flower Show where, on the one hundredth anniversary of the event, the show gardens were as jaw dropping as ever. Organisers and participants have long ago mastered the challenges of ensuring plants and flowers are at their immaculate best for the five days of the show. 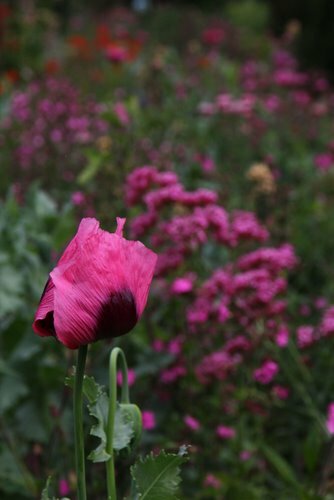 It’s not unknown to use a hair dryer to encourage a tardy poppy to bloom. No doubt plants would be broiled or braised if necessary to achieve horticultural perfection. Much was made in the media this year about the decision to allow garden gnomes a presence, having been previously banned. I expected to see hordes of the little fellas, but no, I only spotted two, and these were in the garden designed by Prince Harry and prominent landscape architect Jenny Bloom. The garden, a representation of a Lesotho village, was created to promote Prince Harry’s African Aids Orphans charity and in memory of his mother Princess Diana. Of course, with the range of eccentric characters one sees at the show, first event of the social season in Britain, gnomes could easily have blended in with the crowds, and there were crowds. The five day show was sold out as usual with tickets online going for hundreds of dollars. Despite the number of visitors, it does not detract from the experience as this is not a rock concert crowd but a gathering of enthusiastic plant and garden lovers from around the world, full of enthusiasm and good will. No pushing or shoving, even politer than Canadians are reputed to be. Another highlight was my first visit to Great Dixter, home and garden of the late Christopher Lloyd. Lloyd, revered by gardeners worldwide was a preeminent plantsman, garden writer, and television personality. Now operated as a private trust with an educational mandate, this rambling yet cleverly structured garden was originally designed by renowned architect Sir Edwin Lutyens for Lloyd’s parents, Nathaniel and Daisy, after they acquired the fifteenth century house in 1909. It is as glorious as ever, though it has never remained static. Lloyd learned gardening skills from his mother, then boldly modified and enhanced many aspects of the garden in the thirty years following Daisy’s death in 1972. After Lloyd’s death in 2006, head gardener, Fergus Garret, has continued to care for the garden. He experimented boldly, creating unique combinations of colour and form. I saw bright crimson tulips soar through swaths of blue forget-me-knots, masses of cow parsley (yes that weed) tempering the kaleidoscopic springtime blaze of poppies, euphorbia, wallflowers, and bluebells. 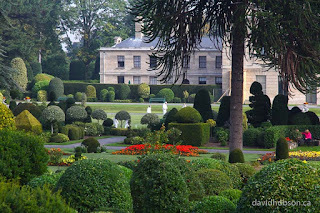 Soft and low boxwood hedges combine with huge ones of yew to form an erratic maze of delights connecting the many sections, or garden rooms, while giant topiary mounds topped by figures of birds, stand like sentinels. Known for his succession planting schemes that ensured colour throughout all seasons, the shrubs, climbers, perennials, annuals, and biennials in beds and mixed borders ensure something is always exploding into bloom. Lloyd certainly had the eye of an artist, or it could be easy to believe he simply wandered about wearing an old jacket, countless seeds carelessly spilling from the holes in his pockets, accidentally creating heavenly vistas. I’m back in my own garden, trying to sort the plants from the weeds that took advantage of my absence — bad timing! 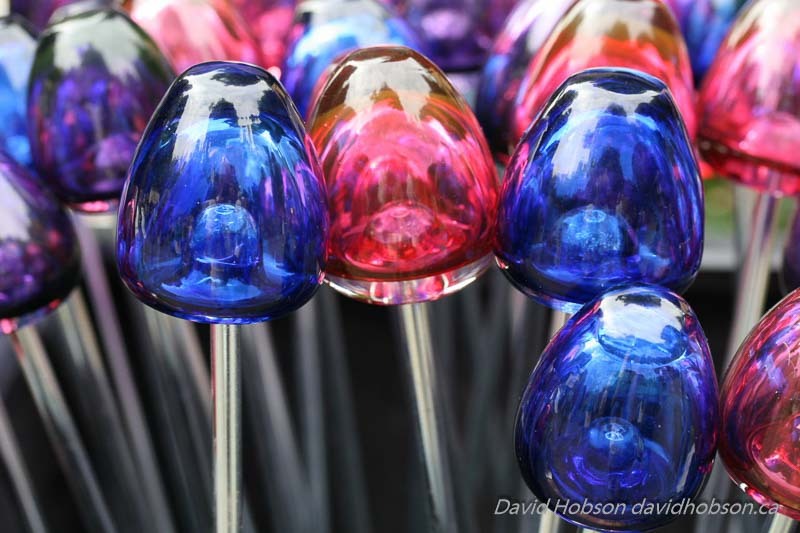 All content copyright David Hobson. Powered by Blogger.